Saxophon spielen - mein schonstes Hobby Band 2 (Die moderne Schule fur Jugendliche und Erwachsene). Composed by Dirko Juchem. For tenor saxophone. This edition: ED 9834; Ring/Spiral bound. Brass/Wind Music. Playing the Saxophone - My favourite Hobby. Grade 1-2. Edition with CD. Text language: German. 130 pages. 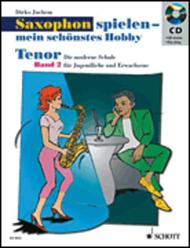 Published by Schott Music (SD.49033325).ISBN 9790001138444. With Text language: German.This saxophone method is suitable for lessons and self-study and is aimed at young people and adults who want to learn to play the saxophone with fun and success. This is why this established method focuses on well-known songs - long-winded explanations and dry exercises are avoided. All subject matters have been wrapped up in attractive songs and pieces which sound like real music right from the beginning thanks to the live recorded playback tracks. Thus, exercising is fun. Another successful instrumental method in the well-known 'Hobby' series. Dirko Juchem has made a name for himself as a saxophonist, saxophone teacher and specialist author on both a national and international level for many years.His saxophone sound and wide range of styles are well in demand: He has played with well-known German and international artists such as Rolf Zuckowski, Barbara Dennerlein, Thomas Anders, Anne Haigis, Harald Juhnke, Pe Werner, Sara K. as well as with musicians of Jethro Tull, Jazz-Kantine or the Mike Oldfield Band. Apart from numerous concerts and productions with other artists and bands, he performs again and again with his own programmes - solo, as a duo or with an entire band. Up to now, he has performed in more than 100 CD and LP productions, and his tours have taken him as far as Los Angeles and Taiwan.Having taught at various music schools as a saxophone teacher and held lectures at the Bundesakademie Remscheid as a guest lecturer, he knows the problems of saxophonists from first-hand experience.In addition, Dirko Juchem is the author of numerous textbooks and tune books for the saxophone as well as a specialist author of articles for musicians' journals ('Sonic', 'Sound Check', 'Fachblatt Musikmagazin').